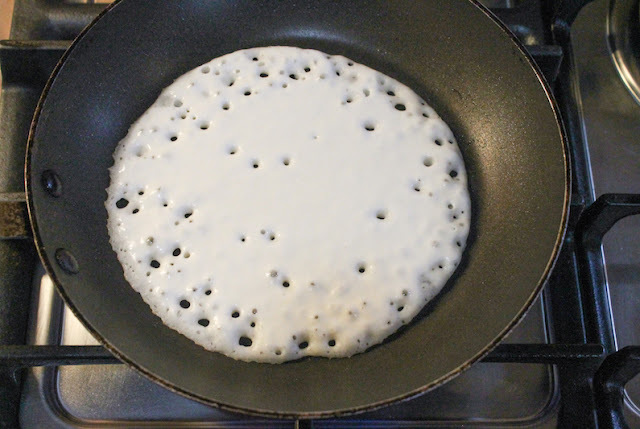 Keralan appam are easy to make, blending soaked rice with coconut milk to make a rich, thick batter. These delicious lacy pancakes taste fragrantly, inexplicably, of butter. 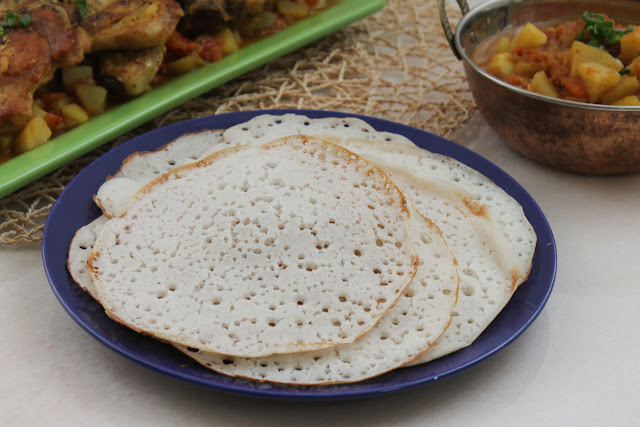 Appam is popular in certain regions of India, particularly the south and the state of Kerala. It’s made with raw and cooked rice, often fermented with toddy or kallu, an alcoholic drink made from palm or coconut sap. 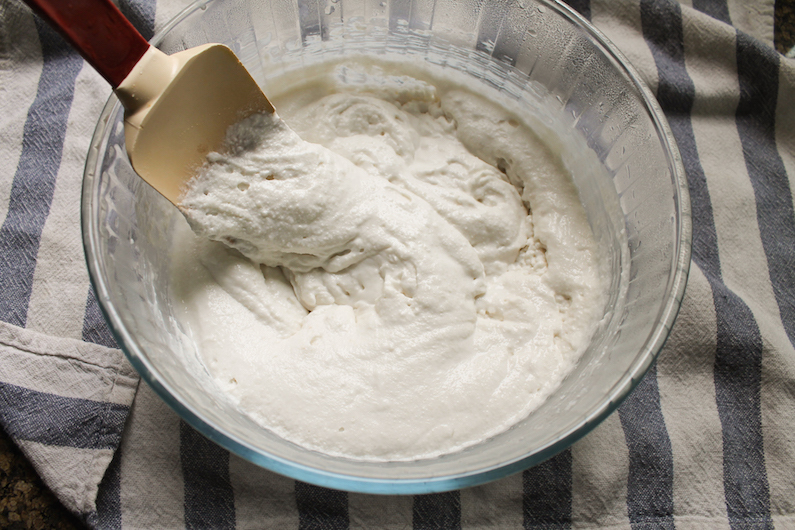 If you don’t have toddy, you can let the batter ferment naturally or add some yeast. Fresh grated coconut and/or coconut milk are frequently present in the ingredient list, as is flattened rice – a sort of rice flake. This month our Bread Bakers are making pancakes. Our host Mayuri of Mayuri’s Jikon assured us that there were pancakes of all sorts and from every part of the world. I had never really thought about it but she is absolutely right. If you search “pancakes” the list is so loooooong and varied! Who knew? 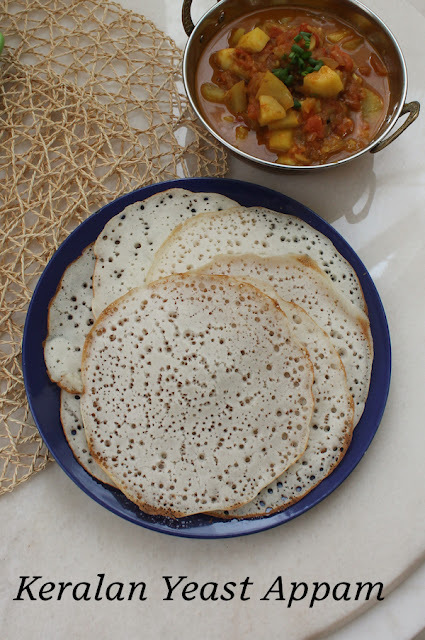 Even if you just search for “appam,” the name I chose out of the main list, you will find countless recipes for naturally fermented, toddy fermented and yeast fermented versions. Everybody seems to think their family recipe is The One. Isn’t that always the way? I must confess to the same conceit about some of my Cajun dishes, even when my mom informs me later than my grandmother never made something the way I do. Clearly one of us remembering wrong. Yeah, I know it’s probably me, but here we are. Some links to check out - these are just a drop in the immense Keralan appam bucket! Anyway, I’ve taken several of those recipes and come up with this one. First of all, I didn’t have toddy. Secondly, I couldn’t find flattened rice. But some recipes called for neither one or the other so I figured I could mix and match. I do have freshly grated coconut but I know many of my readers will not, so I went with a coconut milk version. I used the stuff from the can. Before we get started cooking appam, let me tell you how good these were. I served them with a Keralan pork chop recipe seasoned with cinnamon, cloves, coriander powder and cardamom. It had lots of onions and tomatoes that made a rich gravy for the pork chops and potatoes. Perfect for eating with appam! Even after my husband and I were full, we were picking up pieces of the appam and nibbling on them. How is it that something that contains no butter at all, indeed were cooked on a non-stick skillet with just a little canola oil, can taste so buttery? It made no sense. But buttery they are. We both declared them delicious and worthy of the make-again-soon list. Note: Start one day ahead of when you want to serve the appam. 1 cup or 190g raw rice – I used extra long grained basmati. Rinse the raw rice in cool water until the water runs almost clear. Cover the rice with ample cool water and set aside to soak for 5 hours. Drain the water off of the rice in a sieve or colander. Put it in the jug of your blender with the cooked rice, the coconut milk, the salt and all but 1 teaspoon of the sugar. Mix that teaspoon of sugar with a couple of tablespoons of warm water in a small bowl. Add the yeast and set aside to proof. You are looking for foam to start forming. If it doesn’t, start again with new yeast. 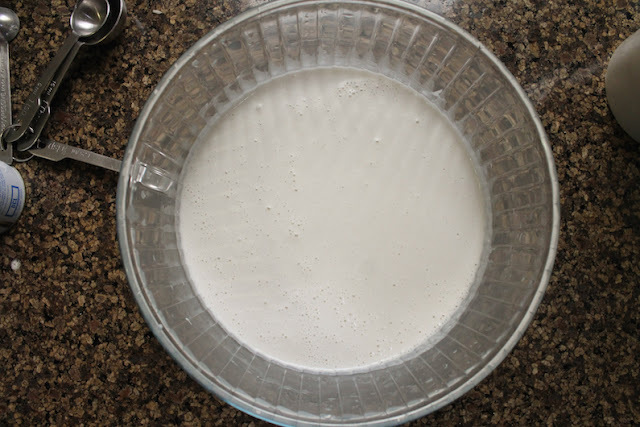 Blend the rice and coconut milk on high until you have a smooth batter. Add in the yeast mixture and mix again briefly. The batter will have the consistency of crepe batter or thick cream. Pour the batter into a large bowl and cover loosely with cling film. Leave overnight to ferment. 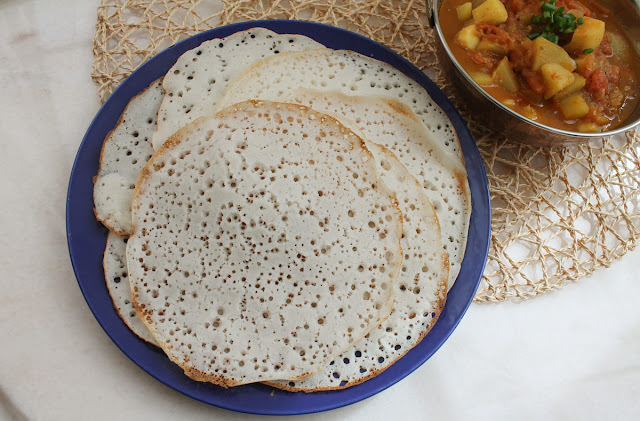 In the morning, if you are not cooking your appam immediately, you can put it in the refrigerator. You can see that the fermented batter really thickens up. At this point, I thinned mine with a little water because it wouldn’t spread out at all. You want to be able to pour it in the pan with a measuring cup or ladle, not just spoon it into the pan. Heat your non-stick skillet over a medium flame and add just a drizzle of canola or other light oil. Pour in about 1/4 cup or 60ml of the batter and shake the pan so it spreads around. Cover the pan with a lid and cook until the bottom is brown and the top is completely cooked. Do not flip the appam. Continue until all the appam are cooked. These are traditionally served as a breakfast or snack with vegetable stew. 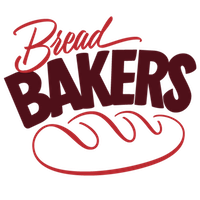 #BreadBakers is a group of bread loving bakers who get together once a month to bake bread with a common ingredient or theme. You can see all our of lovely bread by following our Pinterest board right here. Links are also updated after each event on the #BreadBakers home page. We take turns hosting each month and choosing the theme/ingredient.